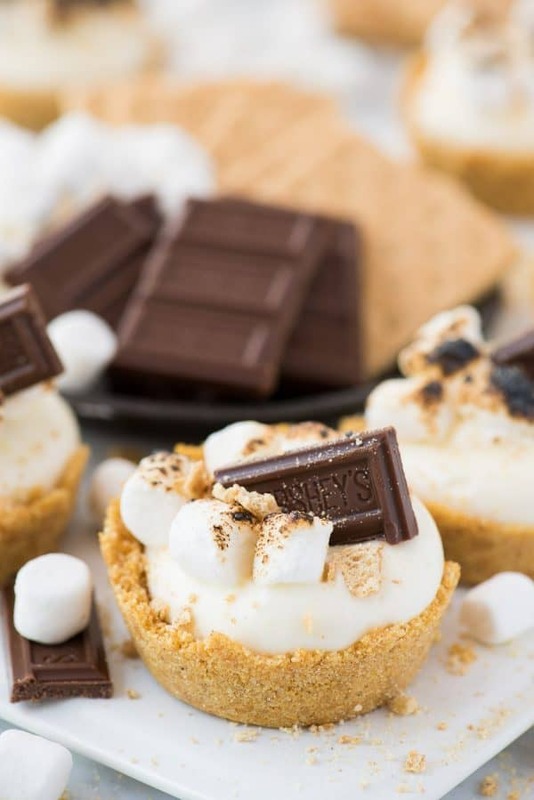 No bake s’mores cheesecake made in a muffin pan to make s’mores dessert cheesecake cups! Because you guys love, love, love s’more recipes. This recipe is like the child of this recipe and cheesecake. 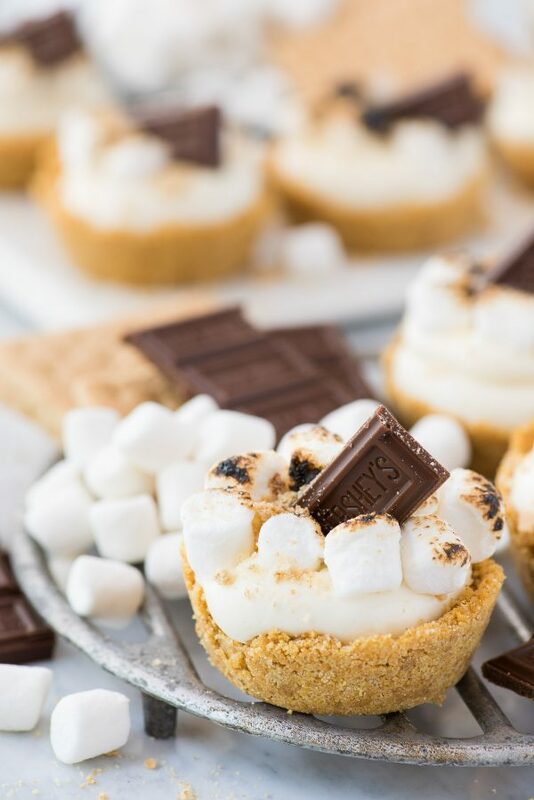 I took the graham cracker crumb cup from the s’mores cup recipe and combined it with no bake marshmallow cheesecake. Buuttttt!! Then you add all. the. garnishes. All of them. You could stop right there. 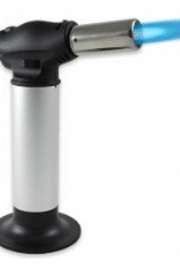 But I’m always looking for an excuse to use my kitchen torch ???? so I toasted (okay, slightly burned) the marshmallows. It adds that something extra to the presentation. The whole recipe is NO BAKE ???? The graham cracker cup tends to be a bit sturdier when pre-baked, I thought about pre-baking the graham cracker crust, but then I was like forget about it. 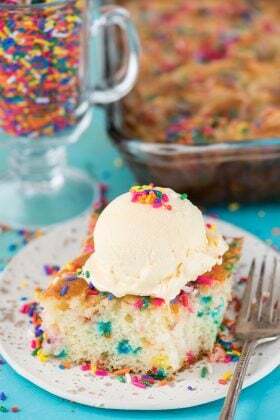 This dessert is messy and that’s just how it is! It does help, however, to keep the cheesecake cups in the fridge until you’re ready to serve them. That will keep the cheesecake chilled and it will also help the graham cracker cups to crumble less when eating! 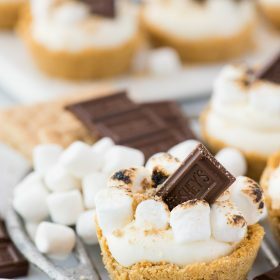 -Make the graham cracker cups first! Use a 1/3 or 1/4 cup to press the crumbs into the muffin wells. Then place the muffin pan in the freezer – this will help the crumbs stick together and form a cup! When you’re ready to remove the graham cracker cups from the muffin pan, use a pointy kitchen knife to pop the cup out of the pan. You can see an example of this in the video below. 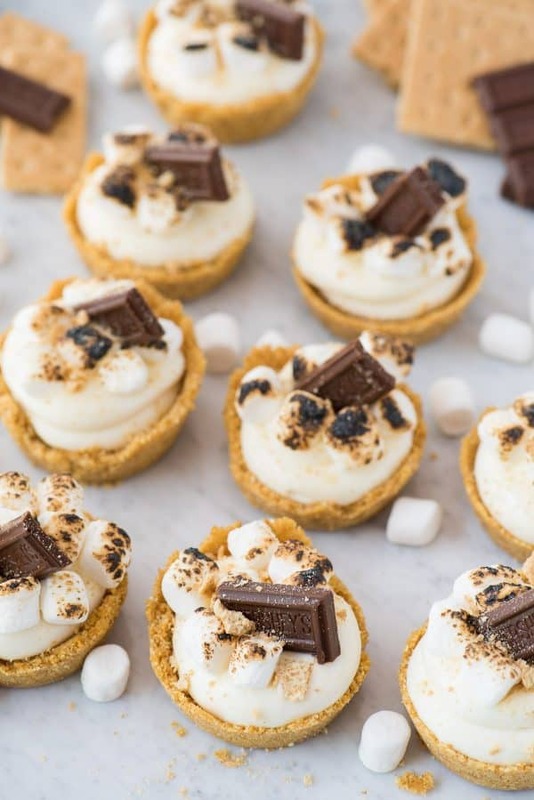 -You could add the garnishes to the s’mores bites either right before you serve them, or add the garnishes (including the toasted marshmallows) then place them in the fridge until serving! 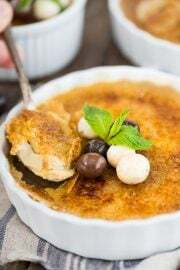 In a small mixing bowl, combine the graham cracker crumbs, melted butter and sugar. Stir until combined and resembles wet sand. 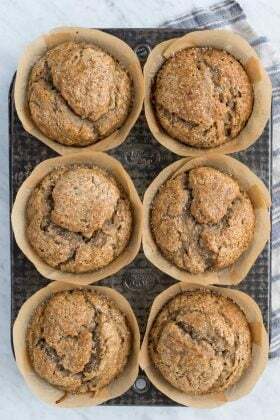 Place about 2 TBSP of crumbs in each muffin well (filling a 12 cup muffin pan). Use a 1/3 or 1/4 measuring cup to press the crumbs into the pan, and up the sides of the muffin well, making a cup. 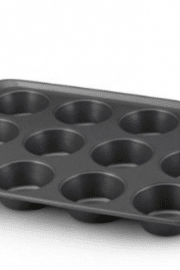 Once the cups are formed, place the muffin pan in the freezer for 1 hour to set. 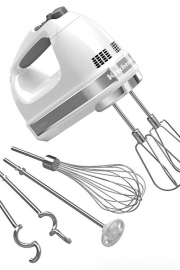 In a mixing bowl, combine the cream cheese with an electric mixer until smooth, 1-2 minutes. Add in the marshmallow fluff, and beat again until combined. 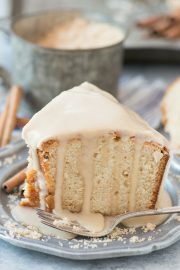 In a separate mixing bowl beat the heavy whipping cream and powdered sugar until stiff peaks form. 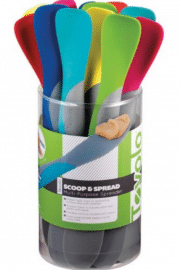 Fold the whipped cream into the cream cheese mixture with a spatula. The cheesecake will be slightly “goopy”. Remove the muffin pan from the freezer and use a pointy kitchen knife to remove the graham cracker cups. Place the cups on a serving tray. Transfer the cream cheese mixture to a piping bag fit with a large, round piping tip. Pipe a swirl of cheesecake mixture into each cup. 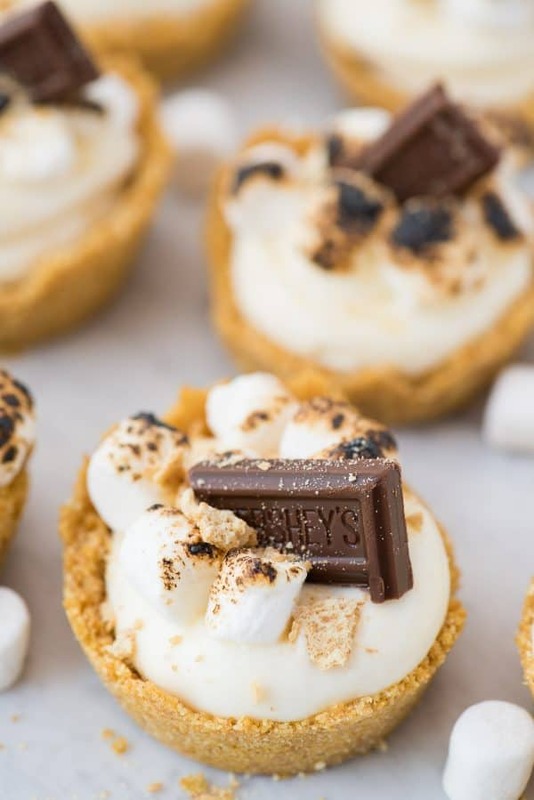 Garnish with mini marshmallows (and toast with a kitchen torch if desired) then add a mini hershey’s bar and graham cracker crumbs. 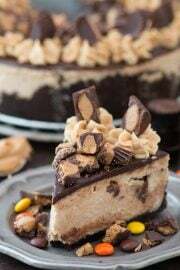 Place the cheesecakes in the fridge to set and keep them in the fridge until serving.